Happy Ides of March, Field Operatives! This is the day that the internet rises up to show their love of one of William Shakespeare’s most beloved historical dramas, Julius Caesar. I’m no different; I am a Bardolator – a term used to describe lovers of Shakespeare that was once used as a pejorative (the word is meant to be a portmanteau of ‘Bard’ and ‘Idolator’) but, like most titles in art, was re-appropriated and embraced by the very people it was meant to demean. However, I feel that focusing on only Julius Caesar does a huge disservice to The Bard. I’m far more interested in how his works continue to influence us and our media. We continue to retell these stories with different perspectives, characters, and contexts to such an extent that we now question what he actually meant to tell us half the time. So today, to celebrate the Ides of March, I’ll be sharing some of my favorite films and books that bare the tinge of the western world’s most celebrated playwright as I encourage you to seek them out and experience them the way I did. Japan – a country that has been historically cut off from the western world and only taking influences in very small, heavily modified doses – has had a difficult time importing The Bard. In fact, the earliest attempts played the drama of Shakespeare off as farcical comedy. However, acclaimed director Akira Kurosawa found the ideal way to make Shakespeare’s Macbeth work in a Japanese context. First, he chose a more familiar art form to translate The Bard into. Instead of western theatre, Kurosawa draws his visual style from Japanese Noh theatre. The expressions, makeup, and actions of the cast are meant to resemble Noh actors and masks; a medium that takes full advantage of the talents of our leading actor, the incomparable Toshiro Mifune. Second, parts of western mythology that would be foreign to Japanese viewers were replaced with similar tales from Shinto folklore. This is most noticeable in the removal of The Weird Sisters, inspired by Greek tales of The Three Fates, and grafting in their place an Onibaba – a demon hag made a legend in the tale Kurozuka (lit. “The Black Mounds”) where she tempted two monks to their deaths whilst singing of the pathetic fates of mortals. Lastly, Kurosawa changes the message to reflect more Buddist ideals rather than western Christian ones. In the British world, there is a cyclical system of rule where chosen monarch replaces chosen monarch. Evil comes when a wicked ruler takes power and can only be undone by a good ruler – “The king is dead; Long live the king.” In Throne of Blood, it is the desire for that power that’s evil and, without spoiling the movie, ultimately spells the final fates of the cast. Even if you struggle to appreciate the different cultural lens, this is still worth watching just to see some of the greatest film talents of Japan who have shaped the cinematic world as a whole. Starting life as a stage play before making its way to film, Rozencrantz and Guildenstern Are Dead is a retelling of Hamlet from the perspective of the titular comic relief side characters Rosencrantz and Guildenstern (… dur-hey). While it’s easy to play the entire show off as comedy, I feel a lot is lost in doing that. This is, in fact, a prime example of a style of performance known as “The Theatre of The Absurd,” a style of fiction that has its cast delve into existentialist thought only to find almost everything absurd – that is to say, “meaningless.” If you remember my pontification of the works of Albert Camus, you’re already familiar with the concept of Absurdist philosophy. This is a great introduction to The Theatre of The Absurd and I recommend you see it either on stage or on the screen. Yes, this is a thing… and it is amazing. Shifting from film to literature, did you know the same publishing company that distributed Pride and Prejudice and Zombies also brought us the Star Wars films redone in the style of William Shakespeare? Author Ian Doescher does an amazing job in recreating The Bard’s style; not only is every episode recreated in iambic pentameter with all of the requite thee’s and thou’s, but he also uses some of Shakespeare’s notable deviations such adding an extra unstressed beat – known as a “weak ending” – for meek characters like Shakespeare did for Hamlet or replacing the elegant verse for simpler prose for the lower born bounty hunter Boba Fett. But what makes Doescher stand out is how he deviates from THOSE deviations. He does things that Shakespeare likely never would have conceived of. Such examples include dropping a beat of iambic pentameter for the character of Jar-Jar Binks (because he’s “one beat short of a verse,” get it?) and writing Yoda entirely in Haiku. Not only is this series a fun way to introduce newbies to iambic pentameter, it’s amazing just how far even the most cringe-worthy moments and lines from the movies are elevated by being written in Shakespeare’s style. Digital denizens of the 90’s, I come bearing great news; Homestar Runner is back! For those familiar with the name, Mike and Matt Chapman – more commonly known as ‘The Brothers Chaps’ – have been slowly rebuilding and reworking their earliest project for years in-between other business; most notably Matt’s writing, directing, and producing of the Nickelodeon children’s show Yo Gabba Gabba and voicing the character of Alfonzo in the Disney XD series Star vs. The Forces of Evil. However, over the last few weeks, the amount of new content coming from their YouTube channel has sky rocketed. For those unfamiliar, Homestar Runner is one of the most enduring artifacts from the days of the pre-YouTube internet when your options for getting visual media on the web were limited and less than ideal. The Chaps, like many early pre-YouTubers, found Flash animation to be a simple way to get seen. But it didn’t start with animation, the original Homestar Runner started life as a children’s book. However, as time has gone on, the comedy has matured for older audiences and, occasionally, finds itself poking fun at its child-like origins. This turned out to be the right move for the series as the original website is still operating off of merchandise sales to this day. I’ve naturally been going back through the back catalog of old episodes and almost all of them still hold up. In fact, some of the jokes actually got better and more relevant (remember when resident shopkeeper Bubs refused to violate net neutrality by “throttling down” download speeds… unlike Verizon?). Still, there are problems with being a web series that has existed for so long that it may as well be the internet’s Stonehenge. Technology and how we use the ‘net has changed so much that many of the techniques the show uses are horribly obsolete. Even the cast recognized the danger in flash not being the universal animation standard anymore. It seems that they’ve finally caved and have gone fully to YouTube in light of the situation. Part of me wishes they could continue with the format they have now because it means the loss of one of my favorite aspects of the original animations: easter eggs. Occasionally, you could click on things in the animation as it played and you could uncover hidden content. Some of these are preserved in ending stingers, but there’s something rewarding about finding a secret ending that makes the experience special and encourages viewership. There’s also the issue with the flagship sub-series Strong Bad Emails (SBmails for short); namely that no one uses email as their primary communications medium on the web anymore. This wasn’t as big of an issue thanks to SB getting an official Twitter account, but it does feel uncanny to someone that grew up with the classic. Plus Strong Bad Tweets (SBeets?) doesn’t have the same ring to it. Still, I remain hopeful. I want to see this great piece of internet comedy history rise like the Phoenix again. Also, I’d like to see them do more joint works with other artists like when they made music videos for They Might Be Giants. Hell, I’d REALLY like to see them continue their series of episodic point-and-click adventure games with Telltale Games. At any rate, here’s to the return of yet another of my fond memories from long ago. There’s no denying it at this point, comic book-based films are the top dog of the modern movie industry. As such, studios are looking to find ways to adapt any promising series or story arch that presents itself. That said, there are a lot of properties and ideas that have yet to be considered that really should be (I dare argue that even the Green Lantern movie could have been improved with the presence of Dex-Starr, the Red Lantern cat). So, to all those young film talents looking for ideas and fellow geeks looking to hound studios to work on stuff, here are some comics I’d like to see on the big screen (provided they don’t screw them up, of course). With Wonder Woman set to have her own film in a little over 2 years, it seems appropriate Marvel should be there to meet DC with their own golden girl. Ms. Marvel is probably the one character that could match Wonder Woman for the title of ‘most important female figure in comics’ and has a wealth of backstory to work from. I would talk at length about it, but A) that would be an article in its own right and B) MovieBob beat me to it years ago and did it far better than I could. There have been some rumblings of Ms. Marvel appearing in Avengers 2, but the stories are slim on information at this at this point and could all be speculation with little confirmed. Still, it would be a welcome addition to the Marvel Cinematic Universe. Update: Apparently Ms. Marvel is scheduled to make an appearance in 2018. Good for you, Marvel. Dirty Harry ain’t got nothing. You know what kind of story is sadly absent from movies? The film noir detective yarn. We saw attempts to use comics to revive the genre with some action tropes in the form of Sin City and The Spirit, but director/writer Frank Miller is to good story what Rob Liefeld is to attractive sequential art (that one was all the comic geeks out there). Instead, I suggest trying again with Blacksad, an award-winning, Spanish produced, French detective comic set in 1950’s America that follows hard-boiled investigator John Blacksad as he investigates major crimes and deals with issues like political unrest and inter-racial violence. The comic uses a technique that is not often seen today due to social stigmas; the use of anthropomorphic animal characters to help build personalities. For example, Blacksad’s character as a black cat is a clever twist on the ‘bad luck seems to follow me’ cliché. We need some good, clever drama in film. And I think Blacksad could provide. And now you know what the killer rabbit from Monty Python and the Holy Grail went on to do. One of my favorite film genres and the one that’s least likely to be brought up in casual conversation among my associates is chanbara (literally, “sword fighting” in Japanese); a set of samurai action films that helped to inspire and shape American Westerns. 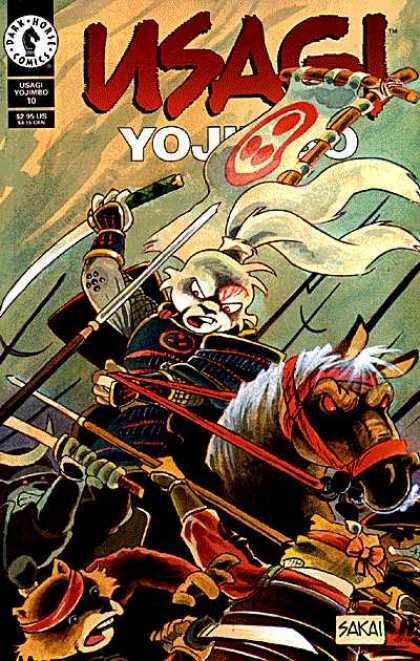 I mention this because Usagi Yojimbo (translation; “Rabbit Bodyguard”) is possibly the best chance to revive the genre. Set in the Edo period of Japan, the story follows the adventures of the white rabbit ronin Miyamoto Usagi (a clever play-on-words of the famous swordsman Miyamoto Musashi) as he fights wars and slays mythical monsters while offering the sage wisdom of a man that seeks the best in himself after seeing the absolute worst that others can offer. If the character sounds familiar to you, you were probably a huge fan of Teenage Mutant Ninja Turtles as a kid as the two made cameos in the other’s stories from time to time. If you’re still unsure as to how high quality an Usagi Yojimbo film would be, I recommend checking out the short motion comic to sample the closest thing available at the moment.